The seed for PYDS was laid fifteen years ago by way of extra coaching to four deprived children of Purkal in an attempt to improve the quality of education. The idea gained momentum and more students expressed their interest which led to establishment of Yuva Shakti School in 2008. Initially started with class V of 21 girls, the School grew up to accommodate 284 children from class I to X by 2012. Poor background and the potential to work hard and succeed have been the only criteria for admission to the School. PYDS has obtained affiliation from CBSE to conduct classes till class XII in FY12-13. Until they obtained their affiliation, PYDS met the expenses for sending the students to a city School. The number of students is restricted to 21 per class and PYDS strives to provide them with multifaceted learning under the guidance of experts from organisations such as International Award for Young People (Youth Empowerment Programme model used by 143 countries nationwide), idiscoveri Education (XSEED Programme - an academic solution to improve quality of teaching and learning), and The Global Education and Leadership Foundation (initiative of Khemka Foundation implementing value based learning across 75 schools across India). The School operates for an additional 50 days as compared to the other schools and utilises this extra time for co-curricular activities like dance, music, theatre, yoga, sports, field trips and other adventure programs. PYDS believes that excellence cannot be achieved in absence of proper nutrition and health care. Thus, the students are provided with wholesome nutrition six days a week. PYDS also bears expenses for elementary care, and those involving surgery, investigation or hospitalization of the children. Under the ‘On to Life’ Programme, PYDS assists graduates (Std XII-CBSE) with placements, admissions to professional institutions and by way of interest free loans or sponsorship. As on Mar13, 76 students have been supported by PYDS under this programme. Early Childhood Learning Centre (Shishu Shakti) is yet another initiative by PYDS for holistic development of children of women associated with Purkal Stree Shakti, sister concern of PYDS working towards women empowerment. As on Oct13, 48 children have benefitted under this programme. Posted total income of Rs17mn in FY13 with substantial contribution from individuals (51%) and foreign sources (41%). Donations unutilised in the FY12 included under Earmarked funds for FY12 are netted off against expenses in FY13 instead of accounting as income. This has resulted in understatement of income by Rs2.3mn in FY13. Martek Morgan Finch Inc is partially funding the cost of PYDS’s ECLC (Shishu Shakti) initiative. Other foundations like The Hans Foundation, Sanganeria Foundation etc. are supporting few classes of Yuva Shakti School. PYDS provides schooling, nutrition and transportation free of charge. 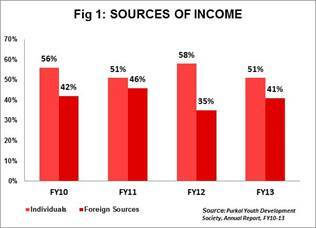 However, beneficiaries voluntarily contributed a sum of Rs0.7mn in FY13 amounting to 4% of total income. 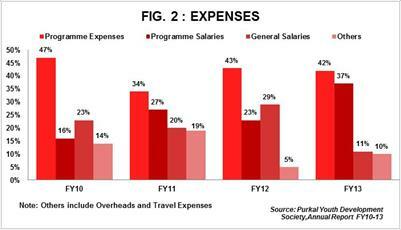 Expenses totalled to Rs20m in FY13 with direct programme expenses accounting for 71% of total expenses, and the balance pertaining to indirect expenses. Programme expenses for FY13 include capital expenditure in the nature of addition to Fixed Assets to the tune of Rs6.7mn (34% of programme expenses). Instead of charging depreciation, the capital expenditure is considered as an expense for calculation of surplus or deficit. Overheads have decreased from 18% in FY11 to 4% in FY12 and have continued to be at 4%in FY13 (Rs9mn). 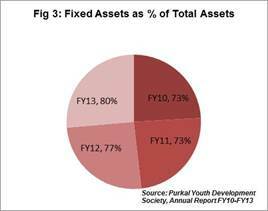 93% of the total funds in FY13 are earmarked funds. These largely constitute unutilised donations in FY13 amounting to Rs3.2mn transferred to earmarked funds. Total income for PYDS in FY12 (Rs17mn) was in line with the total income of Indian Sponsorship Committee, one of the pioneers that institutionalised the concept of group sponsorship in India. ISC is in existence for past 45 years and enjoys support from various Government, NGFA’s, Foreign Sources and Individual donations. PYDS, on the other hand has for past fifteen years managed to raise funds for its initiatives only through the support of individual donors in India and abroad. This is an indicator of the goodwill and trust PYDS enjoys. 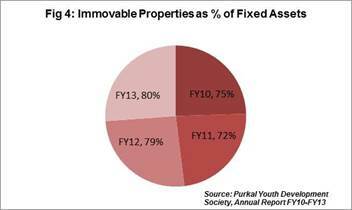 80% of the Total Assets in FY13 are blocked in Fixed Assets with substantial assets being immovable properties. This is on account of additions made in relation to School and ECLC. (Ref Fig 3 & 4). Income has steadily grown Y-o-Y in the last three years. This can be attributed to the fact that PYDS faces donor attrition of about 10% every year but manages to appeal new sponsors. Self-sufficiency ratio measures how much of expenses can be met from own income – individual donations/corpus income/fee income. PYDS has 50% self-sufficiency ratio as more than 50% of its income is through individual donations. PYDS intends to build Contingency Reserve Fund over the years for unforeseen emergencies as currently it survives only on donations every year. So far it has managed to set aside Rs0.15mn as reserve for contingencies included under earmarked funds. Obtaining support from sources other than individuals to fund the annual expense of Rs15mn. Shortage of resources restricting the number of students to be admitted every year to 21. Non availability of science laboratories. Employee attrition due to non availability of conducive work environment and basic facilities. Identifying and counselling the students exposed to traumatic childhood. The General Body consists of all the members who are on the board of PYDS. The directors charge no sitting fees or travelling expenses and work on voluntary basis. PYDS has a governance manual in place to ensure implementation of the policies for smooth functioning of the organization. The fund utilisation statement is shared with all its donors on regular basis. It also ensures that the progress report of the students is sent to all the patrons thrice a year. From FY12, PYDS has introduced quarterly internal audit and six monthly external audit for better transparency and accountability. PYDS is accredited member of Charity Aid Foundation and Give India. It is recipient of silver award at 17th Philip Godfrey Award and regional winner for North India NGO Award, 2011. G.K.Swamy, the founder, was awarded the ICS lifetime education leadership award by the Institute of Career Studies, Lucknow. He is also honoured by Indian Medical Association for excellence in the field of Social Service. PYDS’s work has been highlighted by leading newspapers like Hindustan Times, The Pioneer and Gadwal Post.